When you're ready to cover up on the beach, slip on this supersoft dress. 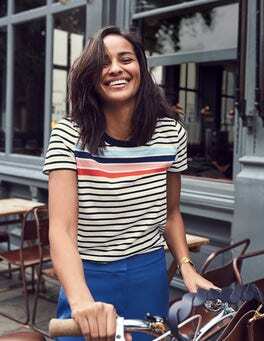 It’s loose enough to make sure you're comfortable, yet retains its shape to keep you looking feminine and put-together. We've also added a unique plaited neck trim to make this a standout piece. What do this merino blend jumper and a frothy cappuccino have in common? They'll both instantly put you in a good mood. The relaxed fit and dropped shoulder are perfect for laid-back dressing. With contrast piping and a choice of statement sleeve detailing, it's a cheery no-brainer. …plush piled coat is ultimately decadent and seriously cosy. The semi-fitted style and soft collar up the luxe factor, though it looks just as good with jeans and boots as it does with an elegant dress. We've added hidden side pockets too – because being glam doesn't mean you can't be practical. Pop this cotton slub dress in your suitcase for an outfit you can wear every day. The colourful print and contrasting pompom trim bring a little bit of fun to the comfortable, relaxed shape. Pull it on over your swimsuit on the beach or team with pumps and a denim jacket for sightseeing trips. Travel just got easier with this pure linen dress. 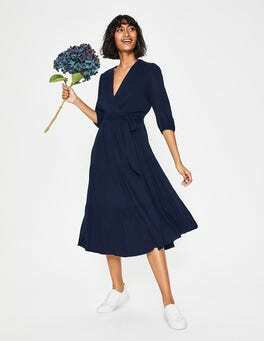 As well as elegant details like scalloped trims and a panelled back, it's got a relaxed fit and A-line skirt for a flowing shape. Colourful graphic embroidery, cap sleeves and a throw-on cut put this slub cotton shift dress at the top of your holiday packing list. The easy shape sits just above the knee, perfect for partnering with strappy sandals. It's a summer winner. Lift your holiday wardrobe with this pure linen kaftan. The waist panel and relaxed fit add effortless style, while the pompom trim lends a creative spirit. Now all you need is a bikini, flip-flops and a plane ticket. 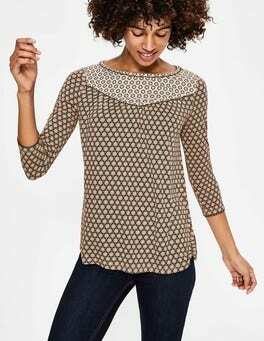 This confidence-boosting top works hard to get you all the compliments. The feminine, drapey fabric teams up with the Boden-designed floral print on the sides to flatter your figure. Match it to your smartest trousers or dress down with jeans during off and on-duty days alike. 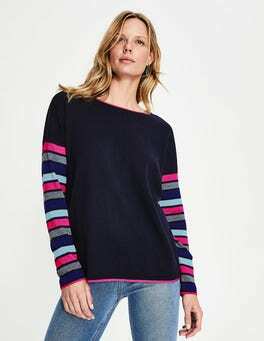 This jumper is super soft and made from luxurious yarn sourced from Inner Mongolia. With laid-back but elegant drop shoulders, it's a versatile piece that straddles smart-casual dress codes with ease. So you could very well wear it all the time.